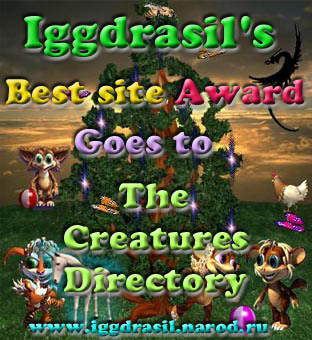 The Creatures Directory page for FAQs, info and other relevant stuff. Do you have a new site or know of one that needs to be added to the Directory? If so, please fill out the form below. Note: It's important that the URL and title are accurate, so that the correct details can be recorded. I do visit every site that people tell me about, so please be patient as it may take a little while for yours to be added. Does your site have Norns for download? Does your site have Cobs/Agents for download? Is your site for: C1? 1. Can I use the banner/logo on my site? 2. Do I have to use the banner or link back to the Directory? No, it is not a condition for being listed in the Directory. However, linking to the Directory would be very helpful and appreciated as it needs all the publicity it can get. And the more visitors it receives, the greater the chance of your site getting more hits.